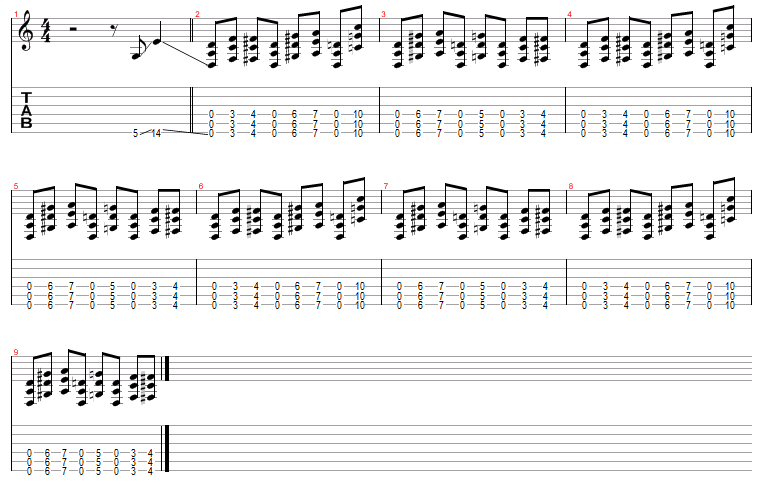 Velvet Revolver Slither Riff. Free Guitar Riffs! For all the Guns 'N Roses fans this free rock guitar riff is "Slither" by Velvet Revolver. This if from their debut album Contraband. This is the main intro to the song (~26 seconds) and is quite easy and fun to play. It is a great rock guitar riff for beginners. To play this riff use your index finger to barre the 1st 3 strings as shown below. It's that easy, all you have to do now is get the timing down. So start of practicing the Slow audio files and work your way up to Faster. Keep practicing this free rock guitar riff and learn to play the guitar! If you want to see the whole song or other parts just let me know and I will post it. "Slither" uses Dropped D Tuning so check out the guitar tuner page and get your low E string tuned down.